Club Penguin Cheats by Mimo777 Club Penguin Cheats by Mimo777: Club Penguin Rockin' Newspaper! 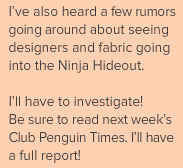 Club Penguin has released a new newspaper! Of course, the Featured article is all about the Music Jam! 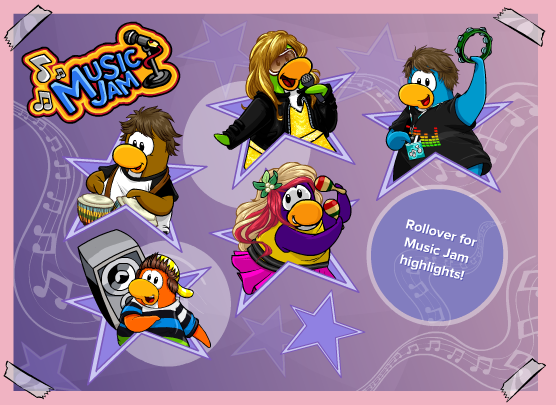 And meet Cadence at the Night Club! Perhaps Shadow Ninja gear? I think so! Be sure to check back next week for more deets! Yep, more Ninja News! "Rewards for Ninjas! AND, prepare for pirates! Woot! Wait! Pirates? 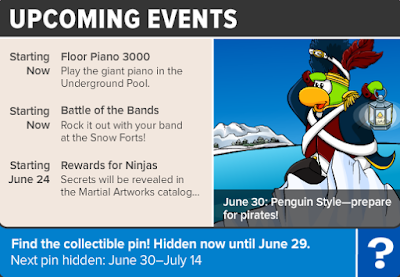 Does that mean more than one or just Rockhopper? Mimo, there is a cheat in the Music Catalog. Click on "Music" for a Blue Drum and Drumsticks! P.S. with the free Green Music Jam Shirt you can wear the free Hat you do the Robot when you dance! Sorry to bug you again but I forgot to tell you that I tried to go to Casa Fiesta but ended up going to Knights Quest 1! Have you noticed that when you go to the dojo there are some dark clouds that werent there before... do you think it has something to do with the ninja rewards? I think the "Prepare for Pirates" would mean that an Adventure Party might come next month! Hey Mimo! Guess what?? If you wear the green music jam tee shirt and the hat, you do a robot dance thingy! It's soooo cool!